Imagery provided by the Butte/Silver Bow GIS and the Atlantic Richfield Company. 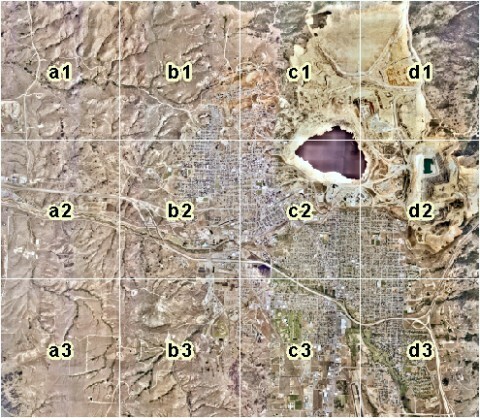 A georeferenced, ortho–rectified aerial photograph of each of the 12 areas shown on the image below is available as a MrSID image. To download an image, right–click on it and use your browser's "Save Target As" function. You may also use the same method to download the entire area in a single MrSID image (193 megabytes). The images have a horizontal resolution of one foot and are in Montana State Plane Coordinates, NAD83, units meters. The images vary in size from 15 to 18 megabytes. Users of ArcMap software will need ESRI .aux files to accompany each image so that ArcMap will understand their coordinate system, or "spatial reference." Users of some software may need .sdw world files to accompany each image to view these images in their correct geographic locations.